This write-up documents the tear down to the frame of my wife’s 1973 BMW R75/5. You can find other material on this project in the list on the right side of this page. As appropriate, I reference other pages I’ve written about this project. I decided to number the sections I write with the leading two-digits of BMW’s part numbers. This identify major sub-systems of the bike. Hucky’s uses the same method to categorize parts for the R75/5 as shown here. I like to take a lot of pictures as I take things apart. That way, many months later when I’m putting this bike back together, there’s a decent chance I’ll have a picture that shows me exactly how the whatzit is aligned with the doohicky as I’m screwing in the framis assembly. I did a visual inspection and took several photo’s of the bike before I started taking things apart. This helped me identify obvious things that are going to need to be replaced or repaired. Then I sat down and wrote up a high level work plan to organize my thinking about how to proceed. You can see the pictures and my high level plan in 01 BMW R75/5 Planning the Build. I started at the front and generally moved to the back as I took the bike apart. Here’s the bike in the shop I built last year before the parts started coming off. The other thing I do is to bag the parts in freezer zip-lock bags and label them with a Sharpie as I go. Then, in the evening when I have some time, I open a bag and clean and refinish the parts and put them back in the bag. I have two stacks of bags, one to clean and refinish and the other stack is parts ready to install. Parts bagging helps keep from loosing parts and simplifies putting things back together. I removed the Windjammer II faring and the front fender first. I’m going to restore the Windjammer II using parts available from Craig Vetter himself. I already ordered what I need and got a note from his wife, Carol, letting me know they had shipped. That was very cool for an old fart like me who remembers when his fairings were the touring rider upgrade of choice. The headlight shell plastic cover was torn many years ago and still has the electrical tape bandage I applied to it to keep the water out of the headlight shell. When I pulled the cover off, the insides of the headlight shell showed no corrosion. Those were the days when electrical tape was stout stuff. Next, I removed the gas tank, seat, carburetors and the exhaust system. Here’s the seat, tank, and disassembled exhaust system. The exhaust system has some corrosion as shown below. I’m going to work on polishing the headers, but after inspecting the cross-over pipe, I’m planning on getting a new one due to the amount of pitting and missing chrome. New mufflers are also part of the parts list as these have been mismatched since we got the bike in 1978. This is the bike after removing the exhaust system and carburetors. You can read about how I rebuilt and refinished the carburetors in 13 BMW R75/5 Bing Carburetor Rebuild. I then moved on to disassemble the top-end of the engine removing the exhaust system, valve covers, valve train, cylinder heads and then the cylinders and gaskets. After that, I removed the battery and air box. You can see this procedure from the top-end tear down of my 1975 R75/6 in the blog post “The Silver Ghost Restoration-Part 3 Engine“, so I won’t repeat that procedure here as it’s the same for both the /5 and /6 models. Here’s what it looks like after getting the valve covers, heads, cylinders and gaskets removed. I used a paint stir stick to keep the connecting rods from bumping on the engine block. After I removed the pistons, I put some wire through the connecting rod end and wrapped it around the cylinder head studs to keep the rods elevated. I stuffed some red shop rags into the opening to keep anything from getting inside the engine. Here’s the box of parts going over to Roadies for bead blasting. I shipped the heads to Randy Long at Long’s Mechanical Services to have them rebuilt. He did the heads on my R75/6 and he’s my go-to-guy for head work. Then, I removed the air box covers, air filter and the battery. Here’s the bike at this point. Then I removed the battery brackets from the frame. Next, I pulled the front wheel and front brake assembly off. I took the brake shoes out to inspect them and also removed both brake arms. This bike has double leading shoe front brakes for more stopping power so there are two arms to activate the brake shoes. Here is the brake arm removed and the inside ferrel that holds the brake cable. Here’s the details of the brake shoes. Note one return spring is longer than the other. The pivot pin is on a shaft that the brake arm connects to. It is held on with a c-clip. I think this will help me get the shoes and springs back together in the correct orientation. The next step is to remove the wiring harness and electrics. Since I’m going to powder coat the frame everything has to come off. I wrote a separate page, 61 BMW R75/5 Removing the Wire Harness & Electrics, covering the disassembly of the wiring and electrics. With the wiring harness disconnected from everything but the the headlight shell, I removed the handlebars and right and left control assemblies and fork tubes as I described in page 31 BMW R75/5 Fork Rebuild. Below is a short summary of that page. First, I disconnected the throttle, choke and front brake cables from the controls. Next, I removed the controls and disassembled them as shown below. Then, I removed the handlebars and pullbacks that were installed on this bike. Then, I removed the steering friction damper rod and friction plates from the bottom steering stem clamp by unscrewing the rod using the black knob on top. Then I removed the bolt and lock nut holding the friction plates to the bottom side of the triple clamp on the steering stem. Here’s a picture of the steering head assembly with fork tubes still attached which is the next target for disassembly. The details about removing the fork tubes is covered on the 31 BMW R75/5 Fork Rebuild page. At this point, the steering stem is still connected to the steering head with the slotted nut. I removed the nut with the hook spanner tool in the bike’s tool kit. The chrome dust cap pulls off and I’ll replace it as the chrome has come off in several places. Using a rubber mallet, I knocked the steering stem out of the steering head. The upper stem bearing is a shrink fit onto the stem and will slide off the stem, but it takes a couple of firm blows to slide it up. Keep you hand under the steering stem to catch it so it doesn’t slam into the floor. At this point, I put some bracing under the front of the oil pan and some jack stands under rear of the frame where the mufflers mount on the bike so it doesn’t pitch forward when I remove the rear wheel. Then I removed the rear fender, shocks and the seat sub-frame. The seat lock is secured to the sub-frame. Remove the bolts on the backing plate to expose the internal locking assembly. To remove the lock assembly from the frame, unscrew the single screw from the back of the locking ring around the lock mechanism. Here is a picture of the internal mechanism of the seat latch button assembly. I took this in case the innards come loose at some point so I can get the spring aligned correctly. I find removing the swing arm from the transmission output shaft is easier if I re-install the rear wheel and also put the transmission in 1st gear. I removed the steel bands on the rubber boot between the transmission output shaft and the swing arm. Sliding the boot off the transmission exposes the four 10 mm, 12 sided bolts that connect the drive shaft coupling to the transmission output coupling. These are on very tight. I rotated the rear wheel to align one bolt so it’s on the right side at the 3:00 position. This way, I can get the 12 sided, 10 mm closed end wrench in the tool kit on the nut since the output shaft coupling rotates to provide more clearance behind the bolt head. Then, while sitting on the rear wheel, I use a hard rubber mallet and hit the wrench on the end to get the bolt to back off. Make sure the box end is flat on the end of the bolt or you can round it off and then you have a real job on your hands. I go around loosening all the nuts and then remove them. This picture is from the Silver Ghost 1976 R75/6 rebuild (note the garage setting, cast rims and my son doing the work) but there is no difference between the /5 and /6. When the bolts are removed, THROW THEM AWAY. These are stretch bolts and should not be reused. If I throw them away I won’t mistakenly reuse them. Here’s what the bike looks like now. Now, remove the swing arm plastic covers at the pivot point to expose the nuts. Use a turned down 27 mm socket to loosen the nuts. You can make one if you have a lath, or you can get one from Cycle Works, as I did. When you get the nut removed, use an allen wrench to unscrew the swing arm bearing out. At this point, the swing arm is free from the frame. The drive shaft is still inside the swing arm. I did not remove the drive shaft as I have no need to disassemble the drive shaft. From what I’ve read, the rear drive coupling has a 150 ft-lb nut and shrink fit to contend with if you want to pull the shaft out of the swing arm. I can repaint the swing arm as is so no need to disturb the drive shaft assembly and risk damaging it. 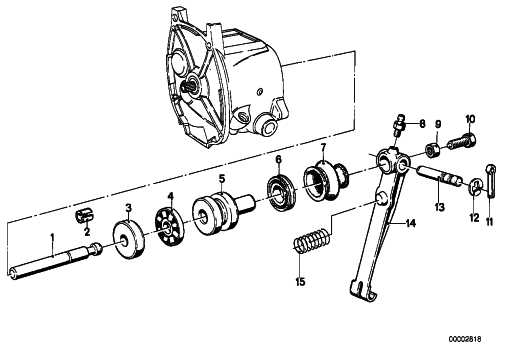 Below is a diagram of the clutch throw-out mechanism from Max BMW Parts Fiche. I’ll refer to the parts by number. The clutch throw-out arm (14) is mounted to the back of the transmission. On the /5, there is a cotter pin (11) holding a pin (13) that goes through the arm and the cast bushings on the back of the transmission. Remove the cotter pin and then the pin shaft holding the throw-out arm. Then you can pull out the throw-out arm from between the bushings. The rubber cup (7) and the spring (15) will come with the shaft. With the throw out arm removed, there’s room to slide the transmission back to the strut across the rear of the frame to remove the transmission input shaft from the engine. There are three allen head bolts and one nut holding the transmission to the engine, each at the four corners of the transmission housing. Remove these and carefully slide the transmission to the rear so the transmission input shaft comes out of the the engine output splines. The transmission isn’t very heavy, about 20 lbs or so, but you don’t want to mangle the splines on engine output and the transmission input shaft. Below, you can see the clutch throw-out rod (1) in the center of the transmission input shaft. In the picture below, you can see the clutch throw out bearing (5) with the throw-out shaft (1) behind it near the center of the transmission. You can push the throw-out shaft (1) from the front of the transmission to the back. The throw out bearings (4) will come out with the throw-out shaft. Here’s a picture of the throw-out bearing and the throw-out arm. And pictures of the ends of the clutch throw-out shaft. There doesn’t appear to be any abnormal wear so that’s a good thing. Here’s what the bike looks like at this point. I put some scrap 2×4 and 4×4 under the front and the back of the oil pan. The top of the stacks are about 1 inch below the oil pan. There are two threaded rods under the engine that go through the frame securing the engine to it. I removed the nuts on the left side when I removed the front foot peg and the side stand earlier. The engine weighs about 70 lbs so its easy with one hand to pull up on the front of the engine to take the strain off the front engine mount and then with a rubber mallet and screw driver, I knocked the front pin out and let the front of the engine down on the wood. The same procedure got the rear engine mount out of the frame. Now, the engine is resting on the wood blocks. The frame is now free of the engine, so I slid the frame forward until the engine was at the rear of the frame against the rear cross brace. My son removed the engine while I kept a hand on the frame. On the left side of the engine, he could get a good hold on the bottom of the timing cover and the other hand under the rear of the bell housing. It was quite easy to lift it up and out of the frame. Be careful as you lift the engine to not hurt your back. Use your legs and straighten them to lift the engine and be sure you can back up a couple of steps so you can put it down without tripping over anything behind you. I put some blocks of wood in the center of my Park-n-Move dolly and put the engine on the wood and then strapped the front and back to the dolly so I wouldn’t accidentally damage the engine. The wheels lock on the dolly so this is a convenient way to move it around the workshop. And, here’s the end result, a naked frame ready to go out for powder coating. One comment I got was to check for possible fractures where the gussets connect the rear foot peg and muffler mounts to the frame. I didn’t find any. You’re posts describing the rebuild of the R75/5 have been invaluable to me in my tear down of my project. Thanks for taking time to meticulously document the process. I am trying to remove the tachometer cable from the timing chain cover, but it is stuck and will not pull out. Got any ideas here? Thanks. If I remember, there is a bolt that holds a sleeve bushing on the end of the cable in the hole it mounts inside of. That sleeve has a slot on one side the bolt slides through to keep the sleeve from rotating. I think I used a bit of Kroil pentrating lubricant (you could try any of the other rusty nut penetrating oils) to help get the bushing to slide out of the sleeve. It took some pursuading to get the sleeve to move in the hole as it is a tight fit and any crud will make it hard to slide the bushing out of the hole. Hi. I am refurbishing a BMW R80 1984. I see that you didn’t disassemble the drive shaft. I assume you had it powder coated? I am a bit nervous about exposing the UV joint to the 350 degree curing temperature. You are right, I had the swing arm powder coated with the drive shaft still inside. But, it’s made of steel and has no rubber nor other “metalable” parts. So I decided there isn’t anything that can be damaged from the heat. So far, no problems after 500 miles of riding. Ok Interesting. I spent last night making a fixture to remove the drive. I will attempt to remove it tonight. I would like the powder coating all the way inside as I found quite a lot of rust inside the tube! I am also curious to understand every part of the R80 so stripping it down to the bones is the best way. You have a great web site. The information is invaluable. thanks for all the work you have put in. I have a link to my photo album for the refurbishment if your interested. I wish I’d found your website when I first began the rebuild on my ’76 R75/6. Luckily I’m only now starting the reassembly so I’ll be able to come here for some invaluable pointers. I’m glad this material is helping out on your rebuild. Best of luck on the project. I’m stoked to have found your blog. I recently purchased a ’71 /5 SWB, and have started the teardown in earnest. I’m sure your blog will serve as an invaluable resource. The Airhead world owes you a debt of gratitude. Cheers! I’m pleased to here that you are going to bring another airhead back on the road. Awesome!!! THANK YOU!! This has been way more valuable than the exploded views I’ve found online and even the Clymer manual! I owe you a beer or six! Well, a couple things come to mind. 1. If you can, try to lift up on the bottom of the oil pan with a floor jack pushing up on a piece of plywood or 2 x 10 scrap on the bottom of the oil pan to take some of the engine weight off the front engine bolt so it can slide. 2. Use some rusty nut lubricant and spray some along the sides of the engine bolt on both ends to loosen any rust that may be impeding the bolt from moving. 3. After #1 and #2, use a drift (a socket or even a smaller diameter bolt will work) a bit less than the diameter of the bolt and a larger hammer and pound on the drift to see if you can drive the bolt to one side. The MAX BMW parts fiche doesn’t show anything except the threaded rod, aka “bolt”, and the nuts and washers on either end, so it is meant to slide through the engine case. First of all, thank you for being a great resource for the Airhead community! Your blog is very valuable for everyone who is looking to learn about their bike and do some self-service. When you started tearing down the bike, how did you storage the fuel tank? Did you fill it up with fuel and add some kind of fuel stabilizer or storage it dry? I emptied the tank completely. I removed the petcocks and the gas cap. Then I washed it out with hot soapy water several times. I dried it for several days and then put a dilute solution of phosphoric acid in it to eliminate rust. Then it was ready for paint work.